When I look today at what's come to be known as the 'Circle Garden' it's a good thing I have some old photos to remember just where it began. 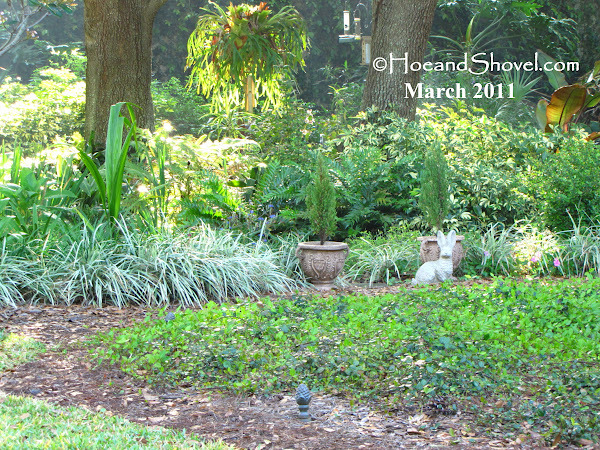 It was first created in January of 2010 as a focal point in the back gardens. After (and during) some freezing temperatures that resulted in a very 'brown' garden oodles more lawn was removed and replaced with ground covers and planted beds. Aren't before and after photos helpful for telling the story and oh, so fun! See all that new growth on the Asiatic jasmine (Trachelospermum asiaticum) in this photo from early spring; March 2011. 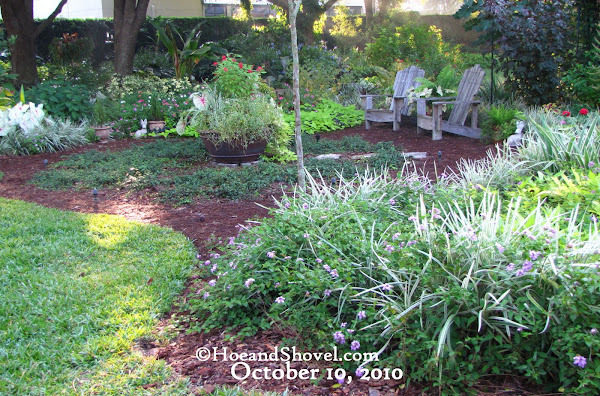 Not a true jasmine but it was chosen here for the (Florida-Friendly ) ground cover due to its easy care and low-growing habit. Today (above photo) it continues to work diligently to fill in the space around the container plant that serves as the centerpiece to the circle (side note: dreams include replacing container with a fountain there). Asiatic jasmine makes a dense mat or carpet of glossy greenery and helps define the circular walkway made of natural pine straw. Winding pathways give wandering feet many options. Natural trails carry them into several directions, from the circle, leading to other parts of the garden. So come with me will you? We'll take a few moments to reflect on the concept of patience and the importance of nurturing those projects in our gardens we lovingly create with lots of back-breaking sweat and humble beginnings. The beginning. 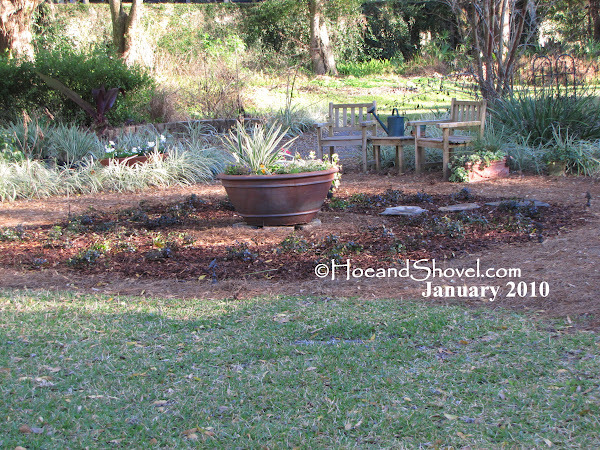 January, 2010 against a backdrop of 'brown' and crispy from many consecutive nights of freezing temps the Asiatic jasmine is just in the ground after removing the lawn in a circular pattern. Later that year we see some gradual maturity after one of Florida's characteristically hot and humid summers. Complete recovery is evident in the back ground as well as new growth in the circle garden. Patience is key! 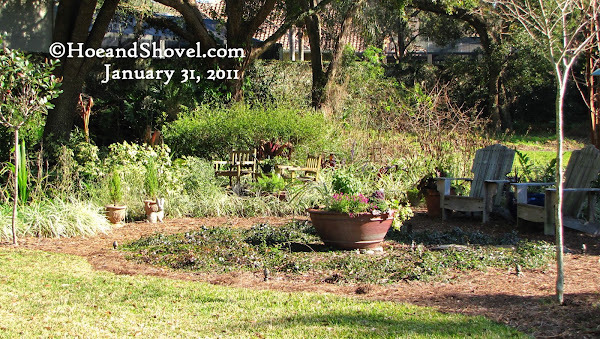 Oh dear, January 2011, exactly one year after the circle garden was birthed. The last three winters here have been hard on Florida gardens. But notice the jasmine is evergreen even after our early, record-breaking December (2009) freezes! Patience reminds us that spring is not far away and recovery is again inevitable. Here we are today. Late August in our hottest, most humid and muggy season and the circle of jasmine is actually *almost* a circle. You may notice the chairs have been changed and moved around during this progression. Those large, weathered Adirondacks were moved to the front garden this past spring when the last trace of turf grass was removed from there. Established perennial gardens combining Florida natives, Florida-Friendly, and tropical plants fill in the planting beds on the perimeter of the circle. 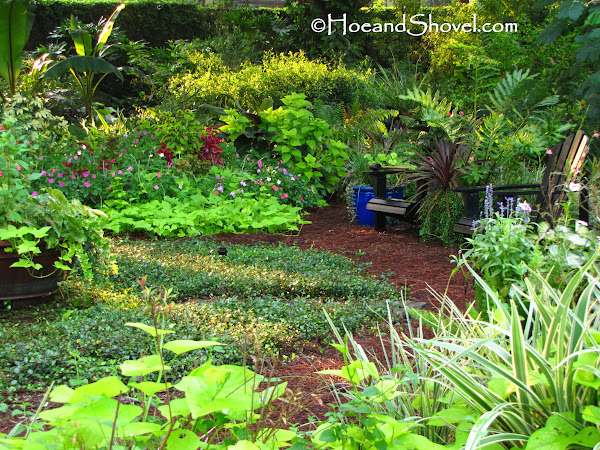 A view to the tropical pathway reveals the most deeply shaded and probably my favorite place in the garden. I'm not sure it's possible to have a favorite place but I do know this is one of the most peaceful and restful places. A view in the other direction is the most open side of the back garden. To the north of the circle is the only significant place left where lawn is beckoning removal. I'm determined to ignore the call (and all the ideas that swirl in my head) since that last lengthy patch of green provides the room to play that family get-togethers require. It's amazing how pictures remind us of our progess. My memory alone surely can't recall just how gradual and yet persistent all at once is the beauty of a growing garden. The lesson :: get started; get growing. Whatever efforts are made whether small or grand are worth the time and energy. In exchange for our toil the satisfaction of listening to our hearts and carrying out our visions is long lasting and beneficial beyond measure to the soul of a gardener. 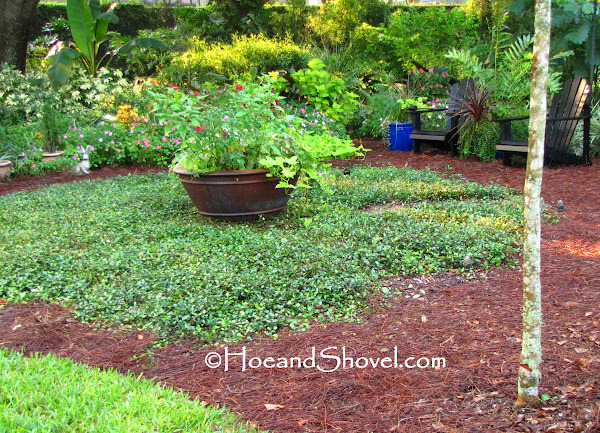 I love your circle garden, and that jasmine groundcover is amazing. Before and after pictures really are inspiring, because you see what you had and what you accomplished. Thanks for sharing more pictures of your lovely bit of paradise. Ooh, we certainly have differing views of Asian Jasmine, but your pictures are beautiful :-) So lush and green! I guess AJ does serve a purpose under large trees where turf grass won't grow. I just don't care for it when it is planted with shrubs and it is not maintained and the vines grow up through the shrubs and make a mess. It is next to impossible to get rid of it once it takes over. Lots of it is dying out here in our drought (can't say I'm sad about that, though). I'm thinking the Asiatic Jasmine might be just what I'm looking for to replace the pine bark mulch next to the house and place around the butterfly and veggie gardens. Thanks for the visual! I just love befores and afters! The circle garden is lovely. I can see why it is so peaceful. I would/could sit there for hrs. Love Mr Bunny, he seems to watch over the circle garden enjoying each growth of it's loveliness. Hey Meems...Yes, it's true - pics do help us see how far the garden has come, and your circle garden is filling in nicely. I've got a couple of questions for you on the jasmine. I've got a groundcover phobia ... always afraid they'll get away from me. How do you keep it from growing into areas where you don't want it? And, how often do you have to do whatever you do to keep it contained? Also, can you mow over it about once a month. Would that keep it trimmed on top. Thanks! Your garden is gorgeous! However, I cringe at the thought of Asiatic jasmine. I'm in tallahassee, with a slightly different climate. But our local native nursery stopped carrying Asian jasmine after having to practically destroy too many people's yards pulling it out. It's been nearly tW years since we ripped up our yard to get it out and I still have to keep an eye out for sprouts trying to take back over! Don't you think the entire garden is a work of patience. Unless you hire all your work done and have someone come in a do it all at once. What fun would that be! This vining, tumbling plant doesn't freeze back so you can imagine how useful it can be. What you describe is how I feel about *creeping fig*(ficus pumila). Beautiful for covering a wall or fence but treacherous once it gets into other plants. Asiatic jasmine is much more well behaved if kept trimmed. I hope this works for those areas you mention. Be sure to research it further to make certain before you plant. Mr. Bunny is movable and it's a good thing because sometimes the impatiens try to swallow him. 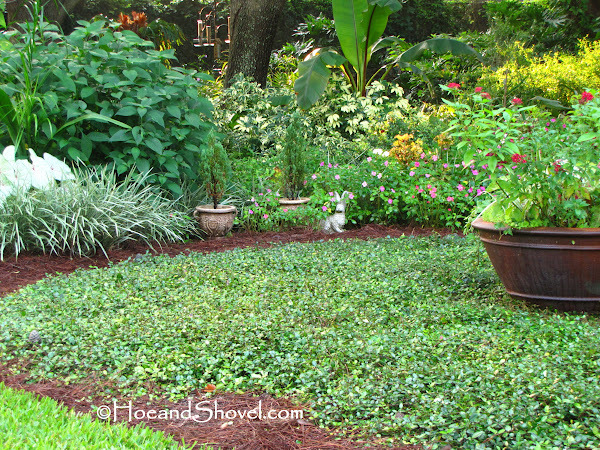 Groundcovers that spread, creep, crawl... certainly have the *potential* to get away from us. The simplest answer to your first question is that I do trim it to shape it (I haven't had to trim the circle garden perimeter yet just on the top to promote intertwining). I use a weed whacker for the surface to keep it at whatever thickness I desire. For the sides (perimeter) I use either an (hand held) hedge shear or the gas power hedge trimmers. Making sure to cut the crawling vines that want to travel out of bounds. This jasmine is planted in several places in my garden as ground cover. Out in the open in the circle garden but right up next to shrubs and other ground covers elsewhere. It only needs to be trimmed 3-4 x's a year to keep it under control. It is a SLOW grower.Mowing over it would not be recommended as it gets too thick and since the thickness of it keeps out the weeds you probably want to encourage your final layer to be about 6-12" thick depending on its use. Hope that helps. Welcome and thanks for your input. This is a ground cover that does require the gardener's attention a few times a year. But otherwise quite easy to control. If left to itself of course it would have some unwanted traveling issues eventually creeping into shrubs, trees, bushes ... the same as any vine. You have given me hope! We recently replaced a ratty patch of lawn (too much shade) in our front yard with asiatic jasmine, and I'm looking forward to seeing a glossy green carpet there soon! 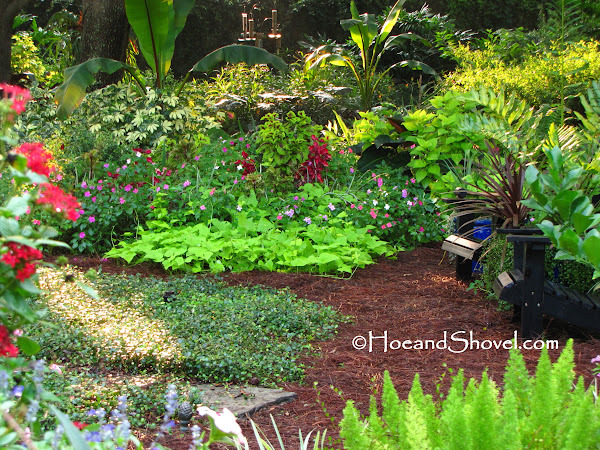 Great photos, and a good reminder that perennial gardening=patience. It definitely takes time for the jasmine to fill in. Keep it well mulched while you wait to keep dow the weeds. In another year or so you will hardly remember it ever had bald spots. Beautiful post, Meems. Loved your last sentiments about listening to our hearts and carrying out our visions. I used a few plants of Asiatic Jasmine on the slope at the rear of our property that goes in the retention area. I'll say it's slow! I finally put down St Augustine after a couple of years which I mow naturally. Two sprigs have not spread beyond a 6" spot, and another is about 4'x4' in about 5 years. I wish the big one would spread faster. Probably mowing it has slowed it down, ya think? I've got a big bare spot to cover. Your circle garden is stunning. I bet you smiled wider at each new photo. Good going. I love your circle garden, Meems. I could sit there and just enjoy all the plants. Sometimes it is really surprising to see what has changed even with just the passing of months, much more years. Such a beautiful flower garden. My favorites are the last two photos. Hi, Meems! Had to get in on that Asiatic Jasmine chat. 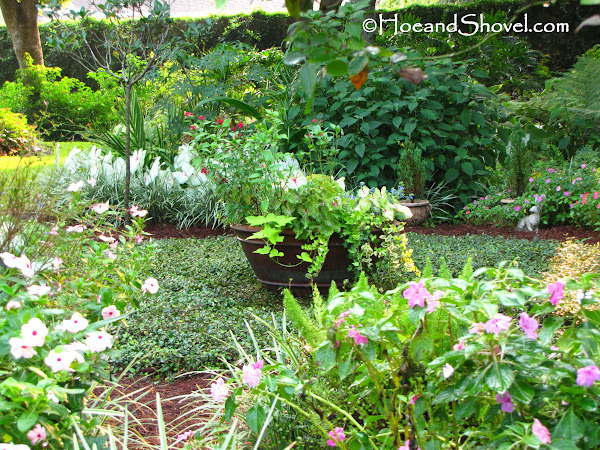 I put in a circular garden with Asiatic Jasmine myself back in 2009. (Great minds think alike, huh?) Anyway, SLOW does not begin to describe it. I spaced my 35 plants about 18 inches apart, and they are still nowhere near filling in...two years later. I've not had to "control" mine yet. I've actually never trimmed it at all. Have to admit, though, I did get a little worried by some of the comments above. Hope I didn't make a mistake with this one. However, I do see this jasmine used a lot in commercial landscapes here, where it always looks good. I talked to a landscaper about it, and he told me it was easy to keep edged. Said he loved the stuff, actually. I loved seeing these pictures. Reminds me that I SO need patience in my gardening. I have, at least, left things alone this season to give them a chance. Your circle garden is beautiful! I admit that I didn't really understand what you were planning when you first shared it, but wow, you knew just what you wanted from the beginning. I have some asiatic jasmine in my front garden that has been around forEVER and it is easily trimmed up and contained. I am planning to add the jasmine to the front instead of grass. I'm going to start one side of the driveway at a time. Maybe, just maybe, I'll remember this post and be PATIENT. Oh yeah, I am copying the pinestraw paths when I put in the front jasmine. Love the look. It just blends so nicely with the plantings. That is quite a story... I have spread my plots (in the past) by digging out a circular piece (the size of a 6" plant)and transplanting it rather than purchasing more. The empty spot fills in pretty quickly and the new plant helps spread the carpet faster. Just a thought. It is true ... even from spring to summer the garden has changed drastically. It is photos that show the details. I'm so glad you joined in with your experience. I'm pretty sure the amount of sunshine and irrigation received has a part to play. It seems everyone has had their own relationship to this beloved plant of mine. We do see loads of it in commercial sites. It requires a consistent eye to keep in under control once it starts to spread but it is not a clinging vine so it is easily removed in unwanted places. Ha! Don't feel bad...my mom said the same thing... she didn't understand either and she was standing right there looking at it when I took all that grass out and explained the concept. YOu've been very patient this year in my opinion and your garden is showing the signs of it. 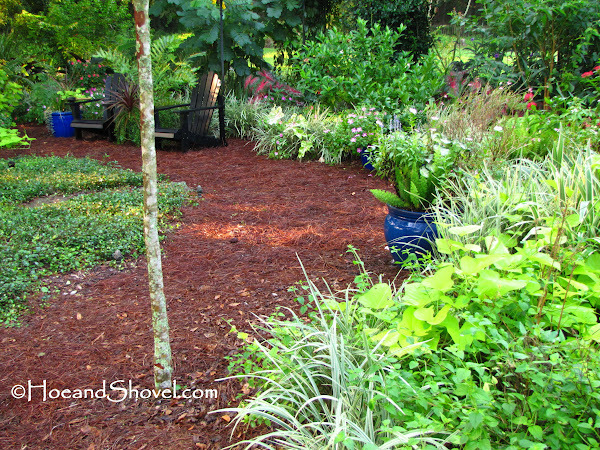 I think you'll like the pine straw pathways... very naturalistic appeal. I just read through 4 of your latest posts and everything looks terrific. Do you have a 'hill' on your property? I ask because your driveway foliage looks like it goes up a hill. It makes the plantings even more dramatic. I love this circle garden time lapse post. I need to do the same...after this drought lets go of our state and things start to grow again (what's left, that is).